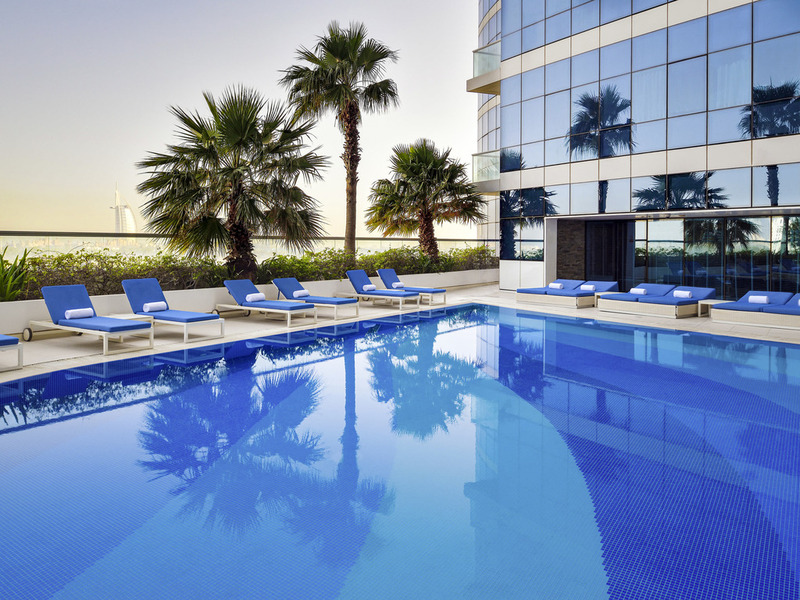 Novotel Dubai Al Barsha is the perfect choice for business and leisure travelers looking to stay in the heart of Dubai and to explore what the city has to offer. My team and I look forward to welcoming you to Novotel! Spacious, contemporary design and adaptable, the Novotel room is truly a place for living. Perfect for all your needs. 465 rooms, 100 interconnecting family rooms, 89 fully furnished suites, free for 2 kids under 16 sharing their parents' room. A 24 hours café serving fresh French pastries, bagels, wraps, sandwiches and salads. A wonderful beverage selection of specialty coffees, teas, fresh juices, smoothies. An oasis in the city, located on the 7th floor and overlooking Sheikh Zayed Road and Jumierah, this poolside bar serves zingy Carribean bites and tropical cocktails. Embrace one of the most chic and sophisticated lounge bar experiences in Al Barsha. Bubbles Bar, a contemporary Parisian lounge inspired bar, is serving signature cocktails and mocktails with lavish décor. Open from midday to after midnight. Welcomed warmly at reception. Suite facilities very good although a strong smell and evidence of smoking by previous residents. Room could do with refurbishment. Excellent views of Dubai from the suite. Windows in desperate need of cleaning so as not to spoil the view any more. Overall is good you need to replace old towels it looks so ugly and spoil hotel image. The overall stay was good. The Indian cuisne served during breakfast was very bad. Tasteless. Idly was hard, Upma was cold and very dry , no salt in dosa and sambar was taste less. The chef has to be really trained. my room was not ready upon my arrivale, while it suppose to be ready a day earlier (we book one day extra before arrival, so we could get in at 10 am), so i could get it at arrival. My laggage got lostin the hotel, and took almost an our to locate it. In the bathroom room, personal hygine items were missing, and were filled in only at 3rd stay day. From the arrival and check in which went smoothly, to a very clean and ambient room, a great bathroom experience with both shower and bath, to a very comfortable bed. The breakfast was huge on options, similar with lunch. Staff were pleasant and helpful in all areas. WIFI Speeds were satisfying. Location was nice with the Metro a few metres away, while the Mall of Emirates was also a walk away. All in all, I liked my stay at Novotel Al Barsha and look forward to another experience with you. Location is very central in Dubai. Service is excellent as well as the room and amenities. I highly recommend this hotel. Nice staff and good location.. But, rooms are too small and breakfast was very limited with few options to choose from. Receptionists were kind to supports. However, other services like amenities and cleaning service need to improve. This is because toothbrush with toothpaste are not provided unlike other hotels. And cleaning services were not provided on time and dishes were not even cleaned until I checked out. I will not doubt recommending your hotel to my friends, family and colleagues. very neat and clean environment, both in room and lobby. good breakfast service period to enable customers have wider choice. We had a very pleasant experience at this site. The hotel is kept clean, staff is resourceful, and the hotel is very near a pharmacy and a comprehensive grocery. I always stay at Novotel Al Barsha. Love the location. The beds were not very comfortable. - First room was a smoking room. It was very disgusting. - Second time, the hotel was full of people. A long queue for breakfast time and for check-in and check-out. The guest service experience was swift and seamless. Had no problems extending our stay. Also the level of honesty and transparency is beyond commendable. At the level 7 bar we forgot some money and the bartender at the time (male) kept it for us until the next evening when we returned.